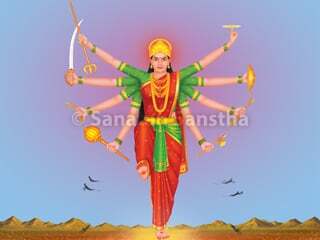 This article elucidates various aspects such as the characteristics of Shakti worship, appropriate actions in Shakti worship, etc. This elucidation will go a long way in strengthening the faith of the worshipper in Shakti worship. The worship performed with faith begets more benefits. The manifest Shakti in Devis is more than that in Devatas and hence, we can experience more Shakti by chanting the Name of Devis. Of course, only those who have done spiritual practice, are above the spiritual level of 35% and can understand a bit of the subtle-dimension can perceive the difference. Meaning : The one who has intense faith, promptness and full control over the sense and motor organs can acquire this knowledge. Note 2 – There is no custom of offering animal sacrifice to the combined form of Shiva and Shakti. 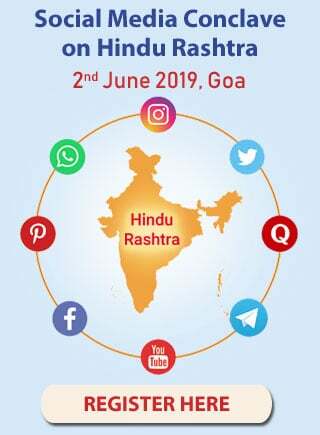 This is a sattvik mode of spiritual practice. It involves use of fewer substances. It is performed purely to appease the Devi. 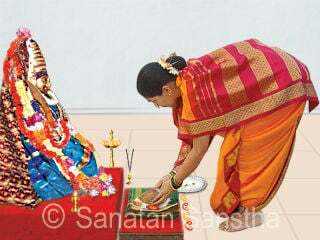 It is recommended that sattvik spiritual practice should be nishkaam (Devoid of any expectation). However, even if some desire does exist, it does not matter, because even in sakaam (With expectation) spiritual practice, the veneration and grace of the Devi is expected in the beginning. Antaryag (Internal worship) and bahiryag (External worship) are the two main forms of Shakta spiritual practice or ritualistic worship of Shakti. Manaspūja (Ritualistic worship undertaken mentally) and yogic spiritual practice is antaryag, while ritualistic worship performed with external materials is bahiryag. Without external spiritual practice, antaryag is difficult to accomplish. Patal : Generating emotion for the Devi in the Mūladhar and other chakras through words in a mantra, thus making the subconscious mind more powerful. 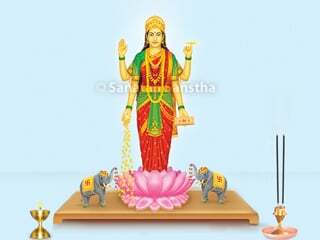 Paddhati : Worshipping the Devi situated in various seats of the body such as the heart with the help of the mantra-patal. Kavach (Varma) : Creating a protective sheath from the words, around the body, by chanting the benevolent mantras. Stotra : Praising a Devi to serve as a reminder of Her mantras. 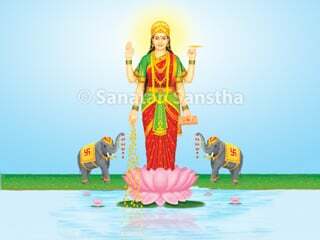 Sahasranaam (Thousand Names) : Reciting the thousand Names of the Devi, signifying Her thousand attributes. Among various spiritual paths, the easy path to bring about faster spiritual progress is ‘Naamsankirtanyoga’ (Chanting God’s Name). If one chants the Name given by the Guru (also known as the Gurumantra) with faith, one attains Moksha (Final Liberation); but if one does not get a proper Guru, how it is beneficial to chant the Name of the female or male family Deity. ‘Kula’ is a family, meaning a group of people who are related by blood or through marriage. An individual takes birth in the family, which has a Kuladevata (Family Deity) he is required to worship. ‘Kula’ means the Kunḍalini energy centre called the Mūladhar-chakra , Shakti or Kundalini. Kula + Devata means that Deity whose worship leads towards the awakening of Kundalinishakti in the Mūladhar-chakra. In other words, one’s spiritual progress begins. Kuladevata can be either a Kuladev (Male Deity) or a Kuladevi (Female Deity). When we are suffering from a major illness, we do not take medicines according to our likes. We consult an authority in that field, that is, a physician and take medicines according to his advice. Similarly, to recover from the great illness of being entangled in the vast ocean of worldly life, that is, to make spiritual progress, we need to practise Spirituality under the guidance of a spiritually evolved individual. However, there are very few such spiritually evolved people in society. Ninety eight percent of the so-called Gurus are not really Gurus. Hence, the query remains as to which Name we should chant for spiritual progress. God, however, has provided us with an excellent solution. He has given each one of us birth in a Kula appropriate for our spiritual progress. When we fall ill, we consult our family physician, since he knows all about our constitution and illnesses. Similarly, when we have to get some work done in an office rather quickly, we contact some acquaintance working there. In the same way, out of many Deities, our Kuladevata is the closest to us, the one who will respond to our call and will make us progress spiritually. When all the Principles in the universe are imbibed by the subtle-body, spiritual practice is said to be complete. Only chanting of the Kuladevata’s Name has the potential to attract all Principles in the universe and increase them all upto 30%. 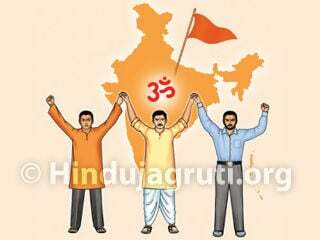 As against this, chanting of the Names of Deities such as Vishnu, Shankar, Ganapati, Lakshmi, etc. increases only that particular Principle in which we are deficient. This is akin to taking Vitamin A, B etc. as a supplement to reduce the deficiency of that vitamin in the body. The Name of the Kuladevata is like a general tonic, which contains all the required minerals and vitamins. At times, despite being intelligent when a student does not study, the teacher reprimands him. Similarly, if an individual has the potential to progress spiritually and yet does not do any spiritual practice, then the individual incurs the wrath of the Kuladevata. Since the individual is unable to comprehend this, the Kuladevata creates obstacles in his worldly life. Since he is unable to resolve them despite the best of efforts, the individual seeks guidance from a spiritually evolved individual who then recommends worship of the Kuladevata. Once this worship commences, the Deity eliminates these obstacles and even helps him in his spiritual practice. 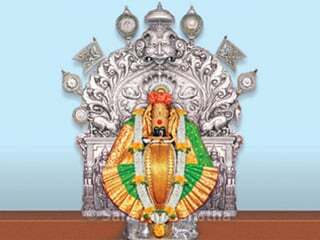 Food offered unto Deities such as Lalita, Tripurasundari, Tripurabhairavi, Bhuvaneshwari, Kamakshi, Shakambhari, etc. is usually ‘puran’ (A sweet made from boiled gram lentil and jaggery). Offerings made unto these Deities generally stimulate sexual desire. Deities such as Lajjagouri, Chinnamasta, etc. are generally offered green saaṛi having yellow border. Green symbolises fertility whereas yellow signifies Dnyan (Knowledge). Deities such as Mayūri, Nirruti, Swadha, Kali, Chandi, Kankaalbhairavi, Mahishasurmardini, etc. are offered food in the form of animal sacrifices. Every Deity has a specific scientific method of worship. It means that there is a definite science underlying every act performed during the ritualistic worship of a Deity. 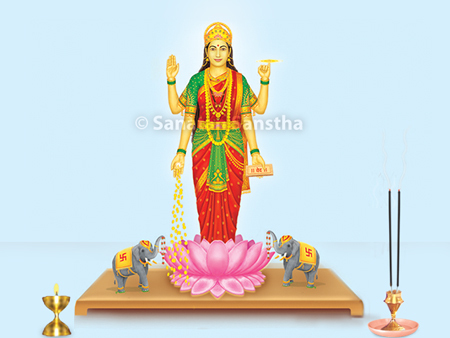 The table ahead gives information on the common rituals performed, that are associated with worship of Adishakti Shri Durgadevi and all Her forms. Sixth centre or chakra in the spiritual energy system; located in the mid-brow region in the subtle-body.